Scholarship recipients pose in front of the donor appreciation word wall. 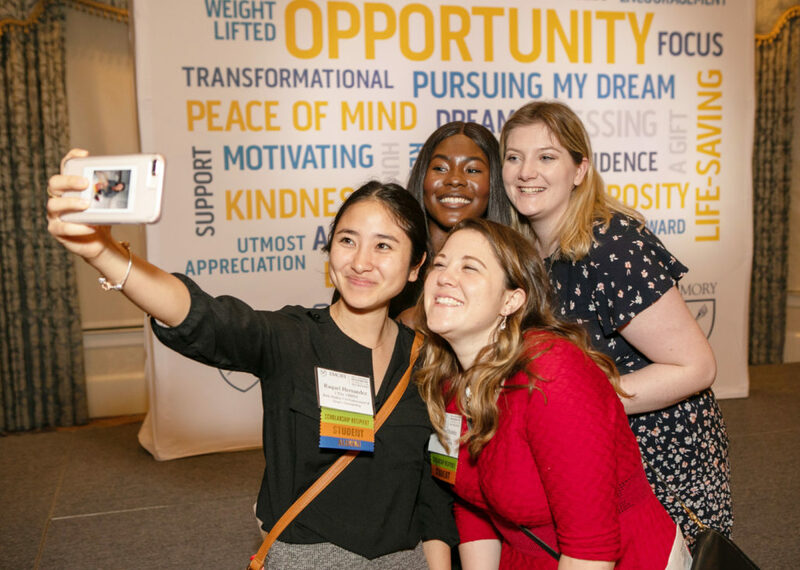 Scholarship recipients at the Nell Hodgson Woodruff School of Nursing expressed their appreciation to donors who helped make their leadership-focused nursing education possible during a reception at the Druid Hills Golf Club. The event included more than 170 donors and student scholarship recipients. 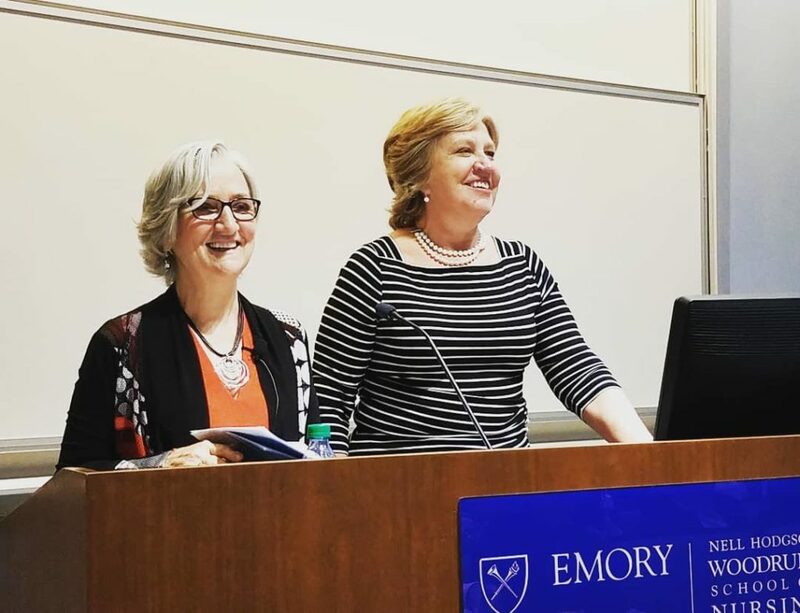 Following President Claire E. Sterk and Dean Linda McCauley welcoming attendees and sharing about the impact donors make to the School of Nursing and Emory University, several scholarship recipients told their personal stories of achievement and thanks for their individual scholarships. Students expressing their thanks were Hannah Spero (19AMSN), a Sally T. Lehr Scholar and Helene Fuld Health Trust Fellow in Palliative Care; Ndinda (20AMSN), a Helene Fuld Health Trust Fellow in Social Responsibility and Dean’s Scholar; and Pele Solell (17Ox 19BSN), a Seavey Murphy Adopt-A-Scholar. All scholarship recipients also shared words to describe what their scholarship meant to them in advance of the reception to create a wall of appreciation as donors entered the ballroom. Donors also had the opportunity to learn about the impact giving has made to the school’s service learning, simulation and research with demonstrations and displays throughout the reception. LisaMarie Wands, PhD, RN, CHSE, CNE, Nell Hodgson Woodruff School of Nursing Simulation Resource Director, shows Eileen Jones (77BSN) a premature infant simulator, the newest addition to the Charles F. and Peggy Evans Simulation Center. During the program, Hannah shared that she worked 60-hour weeks at a VA hospital as a nursing assistant to afford all of her nursing prerequisites and application fees. It is solely because of the generosity of her scholarship donors that she was able to come to Emory. 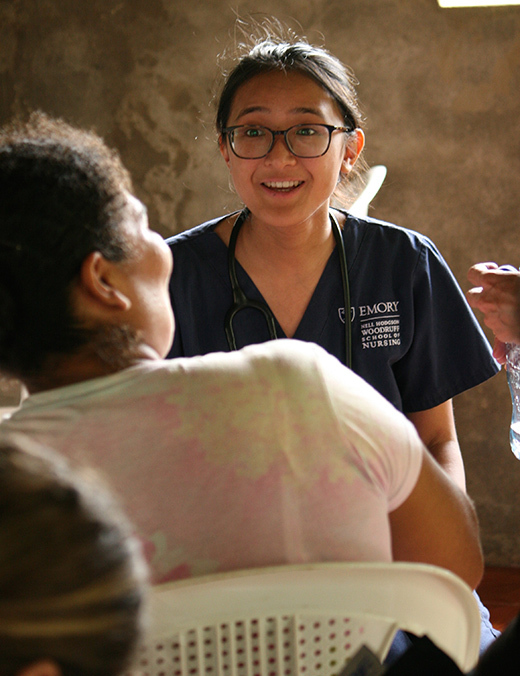 Hannah shared that being at Emory has allowed her to accomplish her dream of becoming a nurse, offered her the most valuable mentors for the rest of her life and continues to build her skill set and confidence as she pursues an MSN and works to become an Adult Gerontology Primary Care Nurse Practitioner. 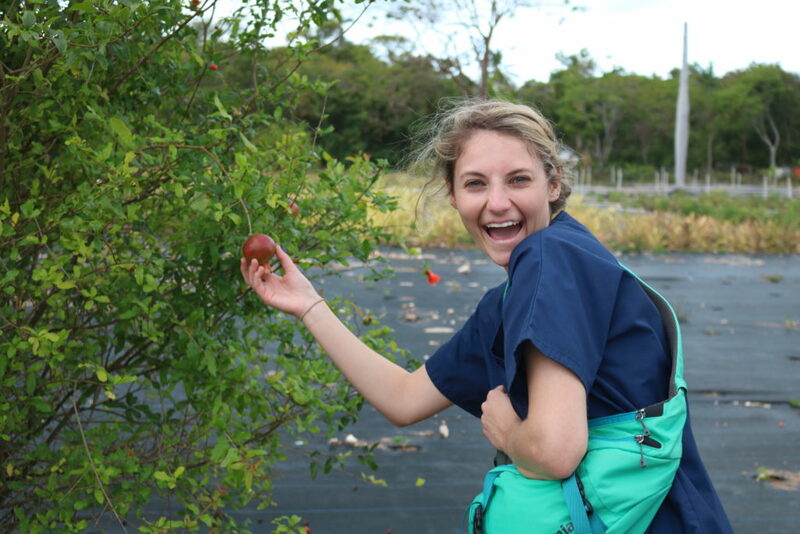 Hannah’s scholarship allows her to focus on her studies and other activities to enhance her clinical experience and develop her leadership abilities. Ndinda also expressed thanks to donors at the reception. Her journey began with pre-medicine, then on to public health and preventive medicine, and now women’s health. According to Ndinda, the School of Nursing supports its students to ensure success in the real world and provides opportunities for research, practice and medical missions in the rural U.S. as well as in the developing world. The mission of the school is to educate visionary nurse leaders and scholars. Ndinda believes the values of commitment to high quality health care, partnerships and social responsibility held by the school will influence her nursing practice in a positive way. Pele Solell (17Ox 19BSN) poses with the donor of her Seavey Murphy Adopt-A-Scholar scholarship, Cheryl Murphy 77BSN. Pele closed the program by sharing that one of the best parts about receiving her scholarship has been the tangible connection with someone that supports her. 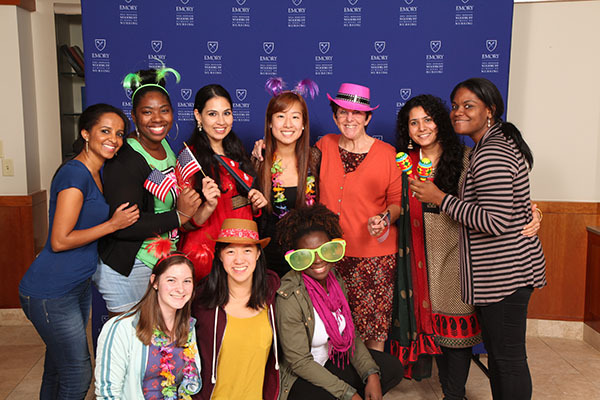 Seeing how the alumni stay connected to the Emory School of Nursing and to each other furthers her appreciation for an Emory education and the relationships she has made. She plans on obtaining a graduate degree in nursing in order to apply her nursing values to the global or public health arena. Pele is passionate about population health and involving community stakeholders, individuals and holistic assessments of health inequities, disparities and needs in order to ensure health care is enacted as a human right. Her scholarship allows her to be enriched with multiple experiences that make nursing school not just about learning skills, but instilling values to shape the health care system now and in the future. 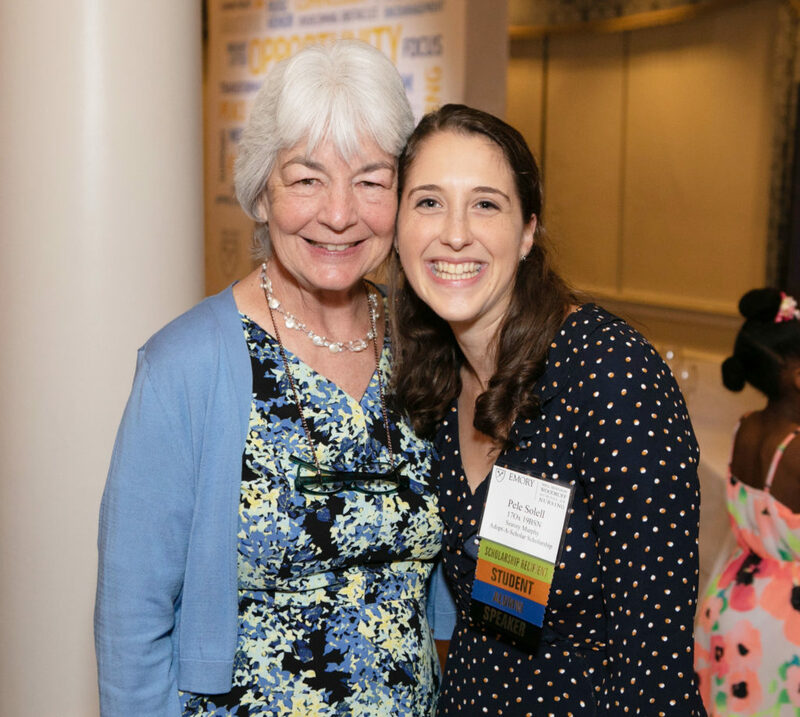 “I am so thankful for Cheryl Murphy for ‘adopting’ me as her scholar, as well as the entire School of Nursing community for the encouragement, challenges and opportunities throughout my BSN degree,” says Solell. 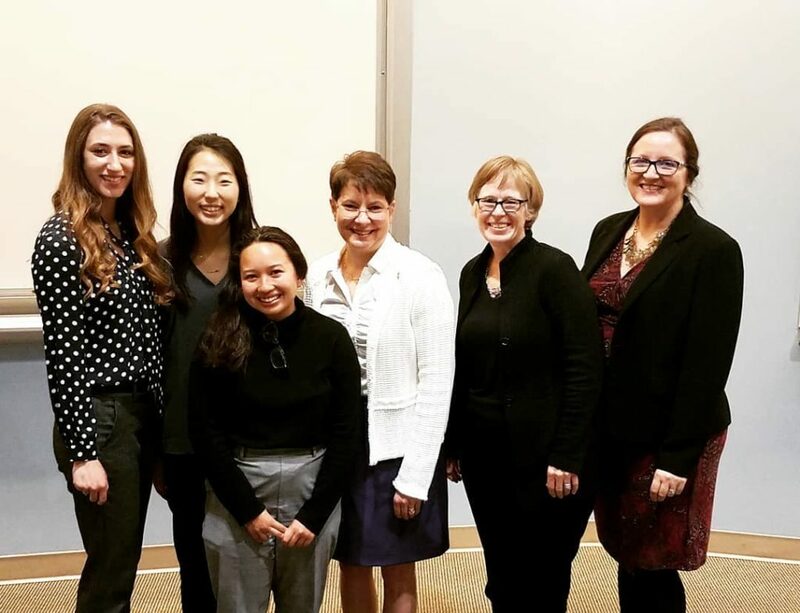 2019 Scholars Day Poster Contest winners were announced just after the lecture. Sigma Theta Tau Honor Society Poster Contest winners were also announced. Today, we woke up at 6:30 a.m. to get ready for the day. By 7:30 a.m., we were ready to head out to Hatcher’s Bay Clinic. After making some drop offs, we arrived at the clinic at about 9:30 a.m. We did home visits this day. We began by visiting an elderly woman who was a couple houses down the road from the clinic. When we arrived, we were greeted by her warming and cheerful presence. We quickly assessed her legs for edema, took her blood pressure, pulse and temperature. We also did a glucose test and checked that she still had enough medication. The next person we visited was another elderly lady further down the road. This woman had dementia and was in a wheelchair. We checked her vitals and her glucose levels as well. Lastly we visited an older man. We did his vitals and noticed he had a very elevated blood pressure. However, he did not believe in taking medicine so the nurse advised him to take an herbal tea he takes to lower his blood pressure and that she would be back in two days to check his pressure again. From there we went back to the clinic and began filling our orders for hurricane supplies that the clinic needed. These orders would be sent to Nassau, which would send the supplies over for before hurricane season begins in June. After the clinic, we headed over to the One Eleuthera Foundation headquarters for a tour of the Center for Training and Innovation (CTI). We learned so much from that tour and from the people who run the foundation. The foundation has invested in training many students to build hotel buildings, sidewalks, gardens and growing crops at the headquarters. The students take courses and become licensed at the end of the program. It was incredible to see that some of the buildings were built from the ground up by students and some had no prior building experience. It was also amazing to hear the plans that the Foundation had for expanding, with the goal of bettering their community. One of the major things I learned today was how powerful having big dreams and determination can be. The CEO of One Eleuthera talked to us about how much the Foundation has done and how much more there needs to be done. His goal was to provide his community with resources such as providing training and licensures that people could then transfer to other jobs once they graduated. It was great to meet these community leaders and see how united Eleuthera really is and the vision they have for themselves in the future. My assignment, along with one other student, was to assist at Governor’s Harbour Clinic. Governor’s Harbour Clinic acts as one of the larger and busier clinics on the island that acts as hub for many other public clinics in the north. As we walked in, we were excited to see that the clinic waiting room was full of patients. We learned this was because it was dentist day. On Thursday the dentist acts out of Governors Harbor Clinic and services all of the patients’ dental needs. The nurses also hold general clinic where patients of all ages can come in to see that their various needs are met. Our assignment was to help the nurses with general clinic. Two patients stuck out in our time there. One patient was a psychiatric patient. The nurses informed us that he comes every two weeks without fail to get his injections. They said that they always try to get him in and out of the clinic quickly because he gets anxious. 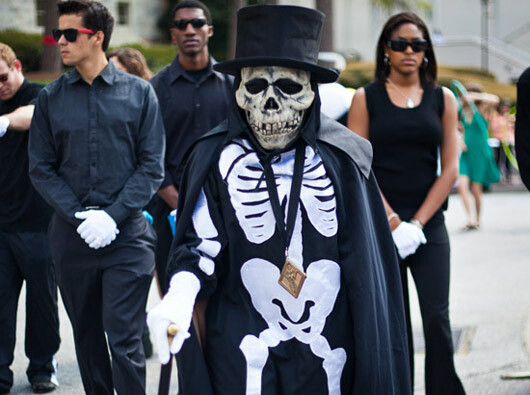 This type of care has been the through line of our experience in the Bahamas. The nurses know their patients and treat them like family. In addition to personifying what true, dedicated patient care is the nurses were also so open to helping us to learn. One of the nurses who worked at the clinic happened to not be feeling well that morning. She complained of chest congestion and a runny nose. The nurses allowed us to assess her and showed us the inflammation in her throat with an otoscope. We were so grateful that although one of the nurses was sick she still allowed us to take it as an opportunity for us to learn. Our time at Governor’s Harbour clinic was unforgettable. We not only learned valuable clinical skills but also how to deliver compassionate patient care. 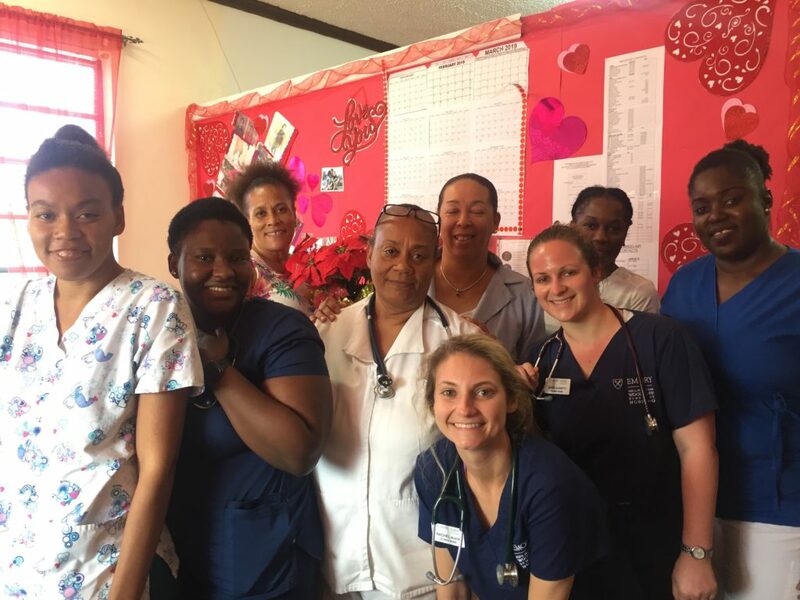 Today, we went into various clinics and schools on the island of Eleuthera to provide patient care and education. I worked with a nurse in the the pharmacy at the Rock Sound Clinic. 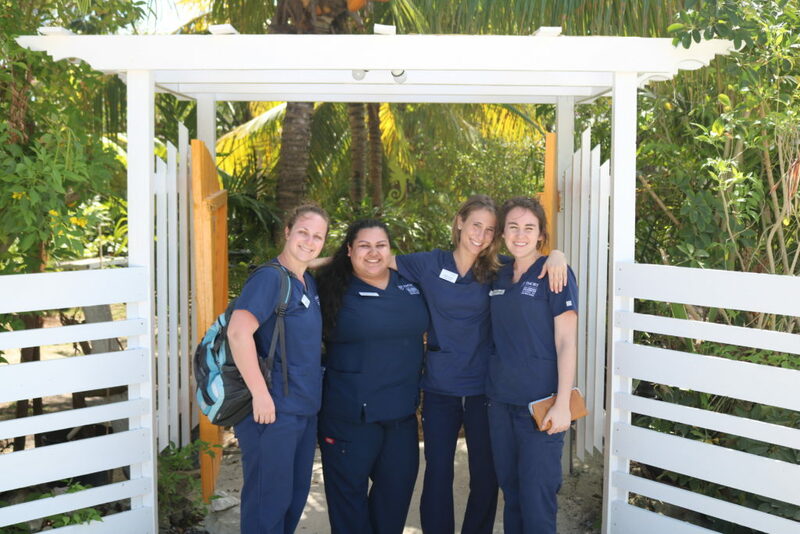 Nurses have an expanded roll on the island of Eleuthera because there is only one doctor to cover the entire south end of the island. A shipment came in from Nassau on a boat, so we were able to stock the pharmacy with new medications. Rock Sound Clinic is the biggest clinic on the southern part of the island, so they send out supplies to the other clinics in the area. We sent a box of medications to the Tarpum Bay Clinic, which is the clinic in the settlement we are staying in. In addition, we filled prescriptions that the other nurses prescribed from the screening area of the clinic. The nurses are extremely resourceful with the limited supplies and medications that they have. The community dynamic in Eleuthera is inspiring. They love their neighbors and take care of one another so we’ll. This was evident in the clinic setting when seeing the interactions between patients and nurses and among the patients themselves. 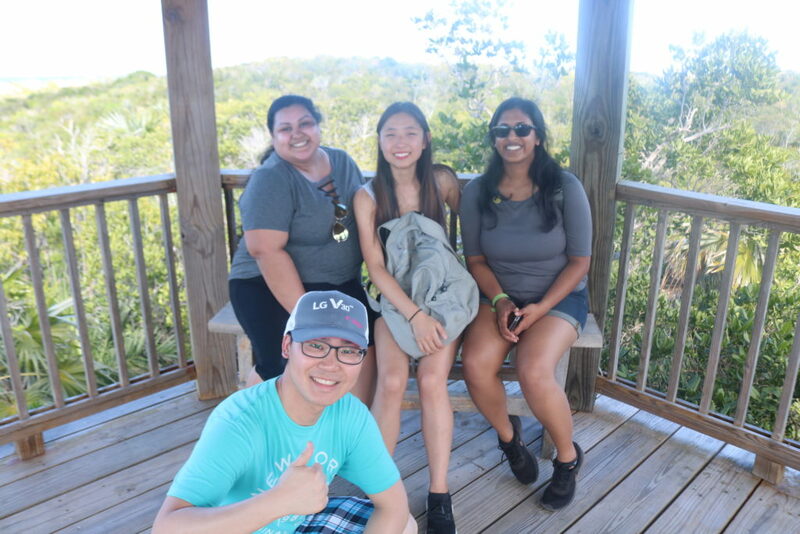 Eleuthera is a beautiful place with beautiful people! Today marks the beginning of our Bohemian adventure. We arrived at the Atlanta airport at 7:30 this morning with our bags of scrubs, stethoscopes and sunscreen. We landed in Nassau for a quick layover and then flew to Eleuthera around 4:30. We were welcomed graciously by Audrey and Vincent, our local contacts here in Tarpum Bay. They hugged our professors tight and told us what they’ve been up to over the last few months. Vincent expertly drove us down curvy bumpy roads to our destination in Tarpum Bay. 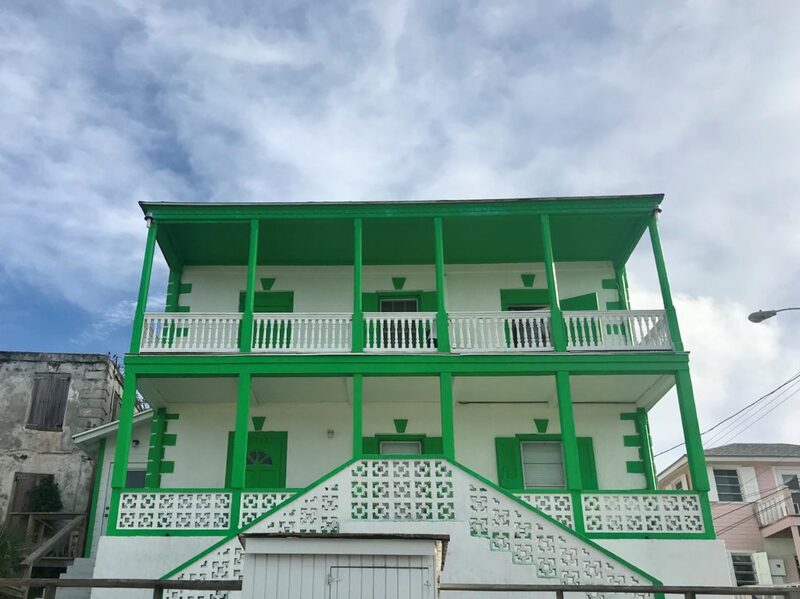 We looked up in wonder at the beautiful green and white bahamian home for the next week. After carrying our luggage up two flights of stairs, we were treated to a feast of chicken, pasta, salad, brownies, and Goombay Punch. Audrey told us about her beautiful country and gave us more information about the population we will be working with this week. After being welcomed so kindly, we feel lucky to be here and can’t wait to see what this week will have in store. We have been absolutely humbled by our time in California. 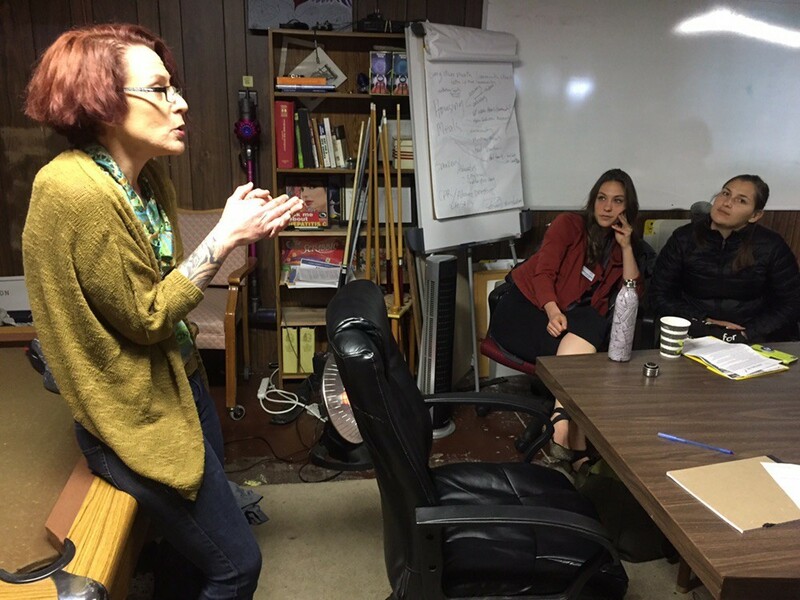 From learning about harm reduction practices to medication-assisted therapy (MAT) groups, we are amazed by the strength and resiliency of the people we have interacted with. These people ranged from directors, doctors, nurses, patients, and other students, and each and every one has sparked something inside of us. Today, we were invited to sit in multiple MAT meetings. These groups were based upon a patient’s recovery level, ranging from needing more intensive care to being more independent. For both groups we attended today, each and every person was so kind and thoughtful. They also expressed so much gratitude for the care and respect that they have received from those who helped them along their recovery journey. It was so inspiring to see such a close connection and mutual respect between allied health professionals and patients. While there was so much we learned today about the different types of medications that aid in recovery, as students, we saw each other become increasingly passionate about what healthcare should be in our eyes. We talked about reducing stigma surrounding mental health and substance use disorders. We each had goals and plans forming in our minds to one day make a difference in a person’s life, one event at a time. We are so ready to bring back what we’ve learned and provide the upmost compassionate, understanding care that we can give. It is so beautiful to be able to watch others talk about their dreams, goals, and passions and one day, implement these in a place where we see so much pain and heartache surrounding addiction. To each and every single person who we’ve talked, cried, and laughed with during this journey, we cannot express how much we’ve appreciated seeing how much you’ve poured your heart out to help others. 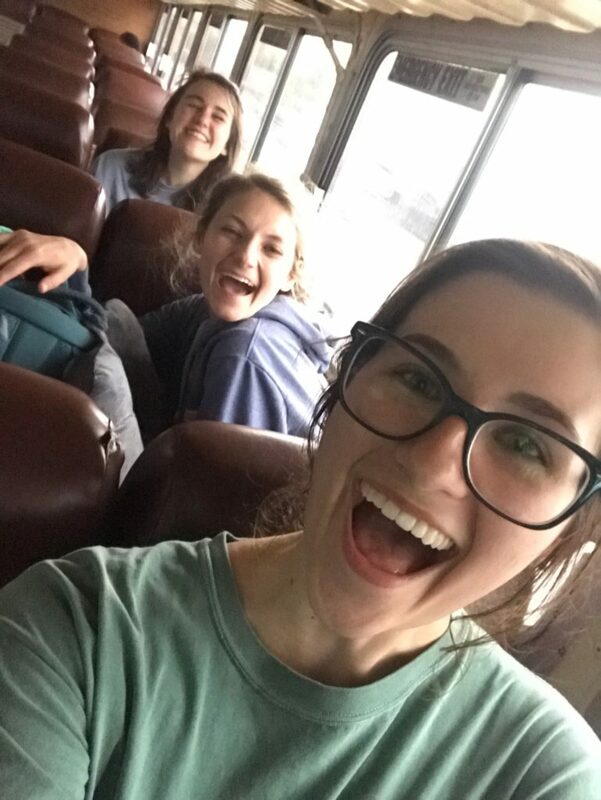 Our time at Chapa-de was very impactful, but it left us all pretty exhausted from the sheer amount of activities we had done. Saturday was a time for rest…but we didn’t stop learning! The program manager of Sierra Native Alliance Loren Nakai highly recommended visiting the Maidu Museum in Roseville. 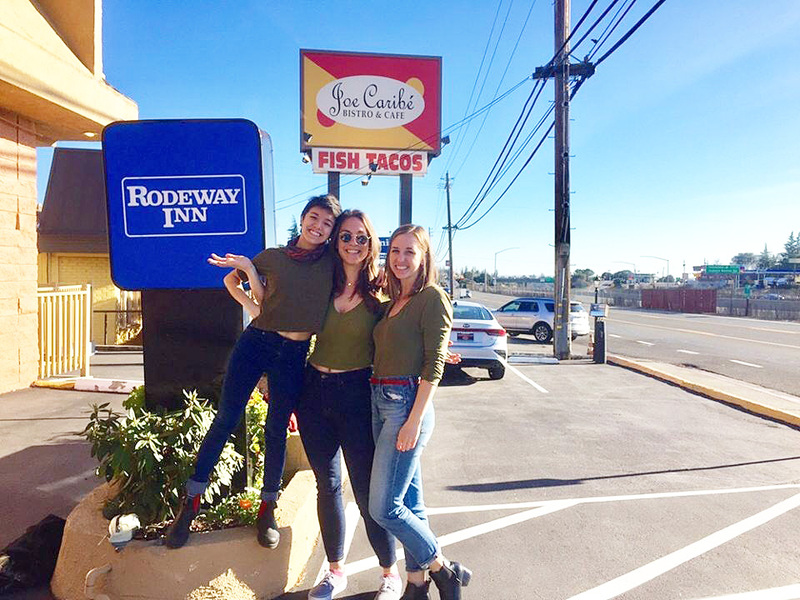 After sleeping in and eating waffles in our pajamas instead of professional clothes, a van load of people headed to the museum. The Nisenan Maidu were the people who had lived in this part of California. Native people have free admission to the museum. Inside, they had many different exhibits about California Indian traditional culture and practices, like acorn processing and basket weaving. Acorn processing begins with removing the meat from the shell then grinding it down with a mortar and pestle. It is then leached to remove the tannins. The end product is acorn flour. There were photographs of Lilly and Daisy Baker, who are the last of the elder Maidu Indian basket weavers, working together, side-by-side. The museum also included the history of forced relocation (i.e. the Nome Cult Walk) and the boarding schools that were made to wipe out their culture. It was really amazing to see that exhibit amongst all the other exhibits that showed that the U.S. government’s attempt to erase their culture and practices away had failed.